Easthampton is a city in Hampshire County, Massachusetts, United States. The town is on the southeastern edge of the Pioneer Valley near the five colleges in the college towns of Northampton and Amherst. The population was 16,053 at the 2010 census. The town grew primarily around the Manhan River, both through its phase as a strictly agricultural community and later, through the industrial revolution, when mills and factories were first built in Easthampton, mainly in connection with textile manufacturing and its offshoots. The first of these, the Williston-Knight Button Company, was established in 1847 by Samuel Williston, son of the town’s first minister, a Congregationalist named Payson Williston. The company specialized in cloth-covered buttons – a coveted item at the time – and to facilitate the operation of the machinery, a local brook was dammed, creating Nashawannuck Pond. Other mills soon opened nearby, a number of them specializing in elastic and rubber thread manufacturing. Following this spurt of industrial development, the town’s first high school and first national bank opened in 1864, and a town hall was built in 1869. Constables were replaced by the town’s first police officer in 1871, the same year that Easthampton became a regular stop on the railroad. The town’s public library opened in 1881, and fourteen years later in 1895, the community was introduced to two new innovations, telephones and streetcars. With the influx of new residents came a number of new churches, founded for Catholic, Episcopalian, Lutheran, and Methodist parishioners, as well as a second Congregational church. In 1899, the West Boylston Manufacturing Company and the Hampton Company, both specializing in cloth production, moved to Easthampton, recruiting a larger immigrant labor force, particularly from Poland and Canada. During World War I, the town’s mills all obtained federal wartime contracts and did well financially, but long before the Great Depression hit, many factories owners were already laying off employees, seeking mergers with other companies, or looking for buyers for their facilities. World War II provided some relief for the Easthampton economy, as several of the older textile companies as well as newer heavy manufacturing corporations received another round of federal contracts. However, beginning in the early 1960s a number of critical closures hit the town hard. Revitalization attempts began with the opening of a new industrial park and continued with joint government-private industrial mall which has failed to solve significantly higher rates of unemployment and poverty compared to Hampshire County. Small farms and well-established small businesses remain the economic core of Easthampton. 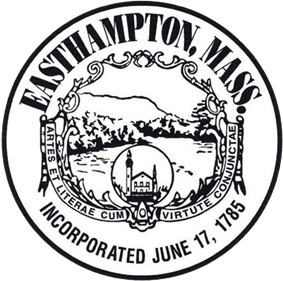 Easthampton changed its charter in 1996 to become a city. The downtown area since 1996 has attracted a small community of artists and young people migrating due to Easthampton's lower cost of living compared to nearby Northampton, a hub of the bohemian community regionally. Small stores around Main Street, Union Street, and Cottage Street have changed business due to the influx of this new demographic. This growth has produced new arts and cultural events such as the monthly Art Walk Easthampton, held each "Second Saturday," in which visual, music and performance artists showcase their talents at venues around the city. Easthampton is bordered by Southampton and Westhampton to its west, by Holyoke to its east and south, and by Northampton to its north. It also has a river boundary with Hadley to its northeast along the Connecticut River. The western flanks of Mount Tom and Mount Nonotuck form its eastern boundary. Easthampton has numerous small streams. In 1797, the town was divided into four school districts. By the middle of the 19th century, the town offered over 12 small schools. Over the following century, the town began to reduce the amount of small schools and began to build schools suited for higher volume. In 1897, an eight-room school was constructed on Maple Street. The Maple Street School was later enlarged to 16 rooms. The junior high school was consolidated here from 1950-1962. After 1962, this school was used for elementary classes. Mount Holyoke College graduate Sarah Chapin, the last principal of girls at Williston Seminary, became the town's first high school principal in 1864. Chapin designed the initial curriculum, and served as principal until ill health in 1891. She retired with the class of 1901 and died that summer. In 1864, Williston Seminary decided to stop offering classes for girls. The town constructed a two-story school for use as the town's first high school. In 1912, the school district constructed a new high school and enlarged this building (then called Park Primary School) using brick salvaged from the Center Union School. It was used as an elementary school until 1939 and again in the 1950s and 1960s. This building, now called the Memorial Building, is currently being used as municipal offices. In 1902, the town responded to the population increase resulting from the growth of the West Boylston and Hampton Companies. The Center Street School, an eight-room school, replaced the Center Union School. In 1920, the interior of this building was reconfigured as a 12-room school. It has served as a middle school, high school, and grade school. Replacing the Lovefield Street School in 1902, the Parsons Street School was built to serve children in the New City section of town. In 1912, a new high school was built. An eight-room school was expanded in 1934, adding a gymnasium and an auditorium. After a new high school was built in 1962, this building was used for a junior high school and middle school. in 1975, it was converted for use as a grade school. Now known as the Neil A. Pepin School, it is still a grammar school. Currently, the town has three elementary schools (Neil A. Pepin School, Center Street School, and Maple Street School), a middle school (White Brook Middle School), and a high school (Easthampton High School), which was built in 2013. As of the census of 2010, there were 16,053 people, 7,224 households, and 4,066 families residing in the city. The population density was 1,192.1 people per square mile (460.2/km²). There were 7,615 housing units at an average density of 527.9 per square mile (203.8/km²). The racial makeup of the city was 93.6% White, 3.7% Hispanic, 1.1% African American, 0.2% Native American, 2.4% Asian, <0.1% Pacific Islander, 1.1% from other races, and 1.6% from two or more races. There were 7,224 households out of which 21.6% had children under the age of 18 living with them, 42.2% were married couples living together, 10.4% had a female householder with no husband present, and 43.7% were non-families. 33.9% of all households were made up of individuals and 25.1% had someone living alone who was 65 years of age or older. The average household size was 2.21 and the average family size was 2.85. In the city the population was spread out with 18.0% under the age of 18, 7.5% from 18 to 24, 32.4% from 25 to 44, 24.8% from 45 to 64, and 14.1% who were 65 years of age or older. The median age was 43 years. For every 100 females there were 92.5 males. For every 100 females age 18 and over, there were 89.7 males. The median income for a household in the city was $45,185, and the median income for a family was $54,312. Males had a median income of $36,446 versus $28,756 for females. The per capita income for the city was $21,922. About 5.9% of families and 8.9% of the population were below the poverty line, including 15.0% of those under age 18 and 9.9% of those age 65 or over. Easthampton was first established in 1785 as a town, with a Board of Selectmen acting as the executive. It had a Town Meeting form of legislature. Local voters enacted their newest charter in July 1996, establishing a city form of governance while retaining the name "Town" in its official name. Michael Tautznik was elected the first mayor of Easthampton in September 1996, after a charter was passed making the mayor the chief executive officer. The Town Council replaced Town Meeting as the legislative branch and consists of four at-large members and five district councilors. In 1999 the mayor and council petitioned the General Court to remove the word "town" from its name and to replace the word town with city. Mayor Tautznik was elected to an eighth term in November 2010. In November 2013, Karen Cadieux was elected mayor after Mayor Tautznik did not seek reelection. Easthampton has a number of points of interest. The Mount Tom State Reservation extends into parts of the city, and many local residents hike up to enjoy the view of the Pioneer Valley from the rock ledges. Mount Tom, 1202 feet (363 m), is the highest traprock peak on the Metacomet Ridge, a linear mountain range that extends from Long Island Sound to the Vermont border. Mount Tom is characterized by its high cliffs, sweeping vistas, and microclimate ecosystems. The 110-mile (180 km) Metacomet-Monadnock Trail traverses the mountain. The Arcadia Wildlife Sanctuary, part of the Massachusetts Audubon Society, is also split between Easthampton and neighboring Northampton. Recently, the Manhan Rail Trail bicycle path was built over an old railroad line, and there are plans to connect the path to others in the area. Also near the Rail Trail and Arcadia Wildlife Sanctuary are three conservation areas owned by the local non-profit land trust, Pascommuck Conservation Trust, part of the Trust's 200 acres (0.81 km2) of holdings in Easthampton. In and around downtown Easthampton, attractions include: - The Cottage Street Cultural District, awarded Easthampton by the Massachusetts Cultural Council and the Commonwealth of Massachusetts in 2013. 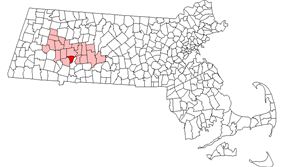 ^ Although it is called the "Town of Easthampton," it is a statutory city of Massachusetts. See Office of the Secretary of the Commonwealth. ^ Dwyer, Edward. Images of America; Easthampton. 1st. Charleston, Chicago, Portsmouth, San Francisco: Arcadia Publishing, 2000. 85-94. Print. Northampton and Easthampton Directory. 1883.